I must say that I've seen the movie several times (if not more than ten times) and since a couple of hours ago, I also finished the book. I must tell you that both the movie and the book kept me interested and they both got me drawn into the story. But if I had to choose, I'd pick the book because the book let us know more about the characters, gives us more details about what they think, how they are, what drives them into the things they do and somehow, Nicholas Sparks makes it possible to see the story in every perspective possible. He makes you look through every character's eyes. I have to admit that the story in the book is different than the story on screen. There are moments in the book, that I thought would look nice in the movie, too. But I completely understand why they didn't put those moments in the film, it was already pretty hard to understand. But I can imagine that it's easier to write about the characters on paper, what they think and how they are, than to put it on screen, because then you actually see them, and there's no such thing as imagination anymore. I enjoyed the book from the beginning until the end and I'm actually pretty sad that I finished it. I think at some moment in life, I will re-read it. That's how much I loved it! So Katie is a young woman who's on the run. She passes a small town, Southport, where she decides to stay. She meets the local shop-owner and widower, Alex and his two lovely children. In the beginning it's all hard and she's still fighting with her feelings about running away and not feeling safe, also she has to survive with the little that she has and she also needs a place to stay, a job, food, etc..
Katie gets closer to Alex, they're bonding, still she can't let go of the past, it still haunts her and at one moment it seems that it's catching up with her. The story is superexciting, with a theme about the strength of women in general, of abuse and starting over. We should all think about the courage of this young woman (and there are many others on this planet) when we have a bad day, or maybe a worse day. We should believe in the fact that we can change all of it, that we just have to take a step in the right direction and start to believe in a better day. We have to believe that faith lays in our own hands and whenever you feel impossible to go through with your life, you have to know that you can just start over! We, as a woman, as an individual, have the right to defend us against abuse, insult, society! Both the book and the movie let these topics come forward! About the movie, I can tell you that I was prejudiced by the fact that it is a movie based on a novel by Nicholas Sparks. And then the cast (hello, Josh Duhamel)!! After being Fergie's husband for all those years, he finally gets the chance to stand out on his own, next to the gorgeous Julianne Hough, in this amazing movie! Also, the always humourous Cobie Smulders, known from the series "How I met your mother", now shows her most vulnerable side. I would recommend both the movie as the book, but if you decide to do both, I would start with the movie and then read the book! I bought the book for €15 (I know it still has the price on it *oops*) on the bottom shelf next to (2?) 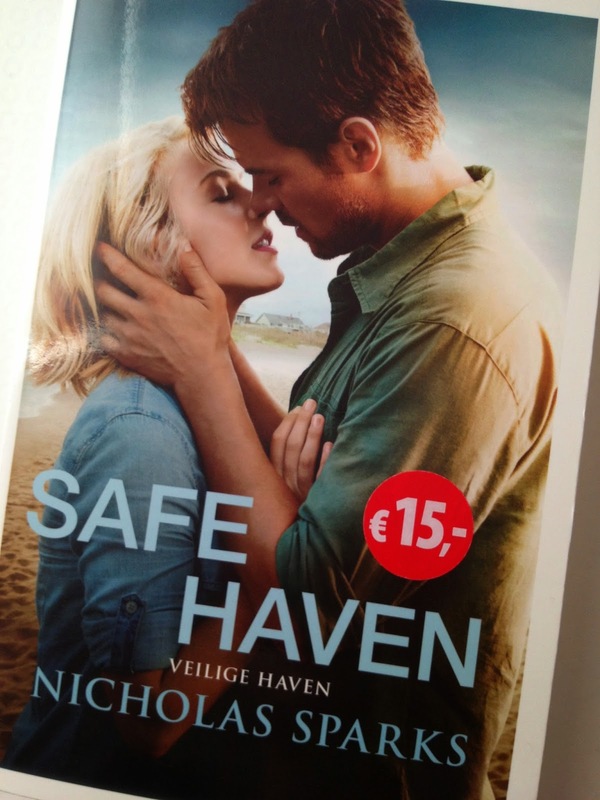 other Nicholas Sparks books, they should be sooo ashamed! But then at least I saw the book, bought it immediately and I couldn't care less about what the rest of the day would bring. I knew I had a long way to go to the car and it was raining outside but my day was just perfect ever since I found this book! Enjoy the book, the movie, or both! Let me know what you think! How to make your own Lipstick!